Last season treble winners Barcelona came up against Europa League champions Sevilla in the Georgian capital of Tbilisi. For what was expected as a mouth – watering game by many, I’m sure they weren’t disappointed with the final outcome. For many years Barcelona have been praised constantly for their ability to keep possession in tight areas in order to create a goal scoring opportunity. Having so many players with such a good technical ability contributes to this way of play. A method of Barcelona’s play to create large amounts of space to take advantage off is by using the wide areas in order to make the middle of the pitch more dangerous. Barcelona have dangerous dribblers, in this game Messi was playing on the right, when he received the ball almost every touch was inside of the pitch. He then has limited time to make a pass into the middle of the pitch – but being the best player in the world he has the ability to do so. If there aren’t any players screening the central players higher up the pitch, there will be space for Messi to exploit with his fast dribbling. Looking at the image above, Messi has received the ball and took his first touch inside the pitch. 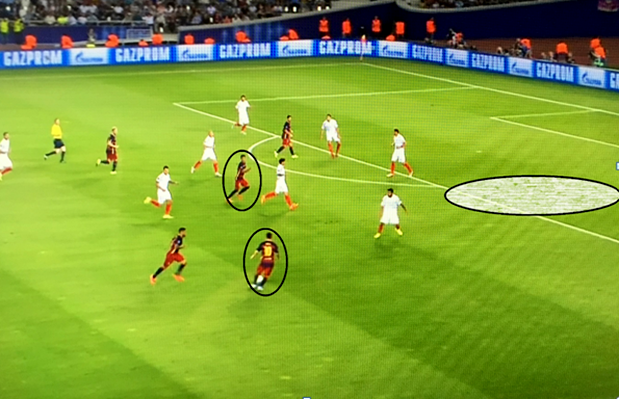 Circled as well is Rafinha, three things can occur here involving Messi and his young team mate: 1. Rafinha can make a direct run in behind, allowing a passing lane to open up to Suarez. 2. Rafinha can make a direct run and receive a perfectly timed pass from Messi. 3. Rafinha can make a direct run in behind to create space for Messi to take advantage off, making him closer to the oppositions goal and in a good area to possibly shoot from distance. The following image identifies what option Messi chose. Messi identified option two as the most dangerous. A perfectly timed pass and run created an opportunity for Barcelona. The movement of the ball is the most important aspect of this method. When it goes out wide to come back into the more dangerous area of the pitch – middle – it has to be done at pace. With the ball moving at speed, it will give Barcelona players a higher chance to split the opposition’s lines in order to create a goal scoring opportunity. Barcelona are also effective at doing this in deeper areas of the pitch. Deeper than the previous image shown, Rakitic has received the ball and is looking to go inside of the pitch. Messi – being the most dangerous player in these areas – is involved once again. He has done well with his movement to have space around him for when he receives the ball. Suarez has offered a different option by making a direct run in behind the defensive line, although Rakitic didn’t use this way of attack it took another defender out of the game, giving Messi more space as we’ll see in the next image. Messi has done fantastically well to beat the defender in this situation with an effective turn. As mentioned previously, Suarez’s movement to take his defender deeper has created more space for Messi to exploit. Marked out by the blue lines, if you put Messi and this amount of space together, you’re asking for a dangerous counter attack. However, Messi chose against using this space and passed wide to Iniesta, but why? By the time Messi beat his opponent with his turn, the other midfielder was too slow to get over – giving him time and space to run with the ball towards the defensive line. If he did, he could have played a through ball for either Suarez (out of picture) or Rafinha (furthest away in the picture) or shoot from distance. A team who commit so many numbers forward can be exploited through fast and effective counter attacks. This was seen as a problem for Barcelona on Tuesday night. However, Barcelona’s problem throughout dealing with Sevilla’s counter attacks was their defensive positioning against crosses. This counter attack is a clear example of Barcelona’s weakness. 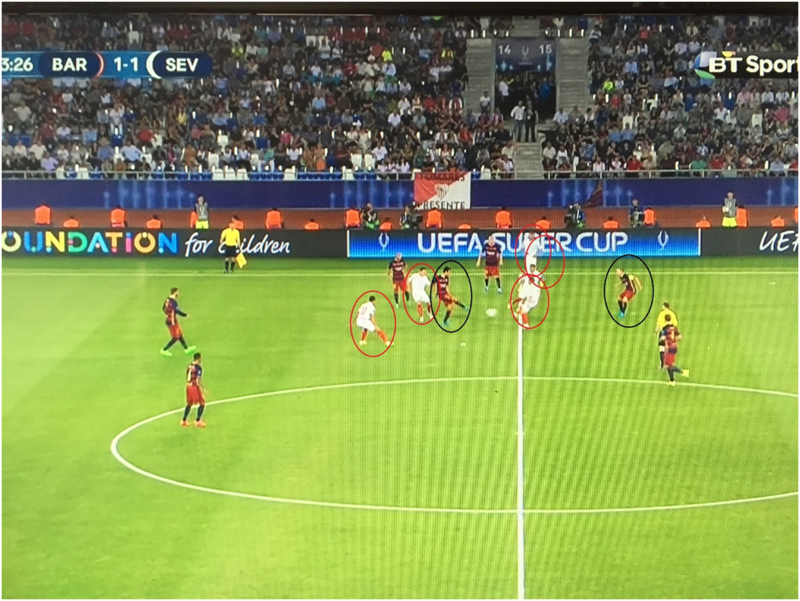 Pique – furthest away player circled – is in a good position. He’s in the width of their box, preventing space for players to run into at the front post area. 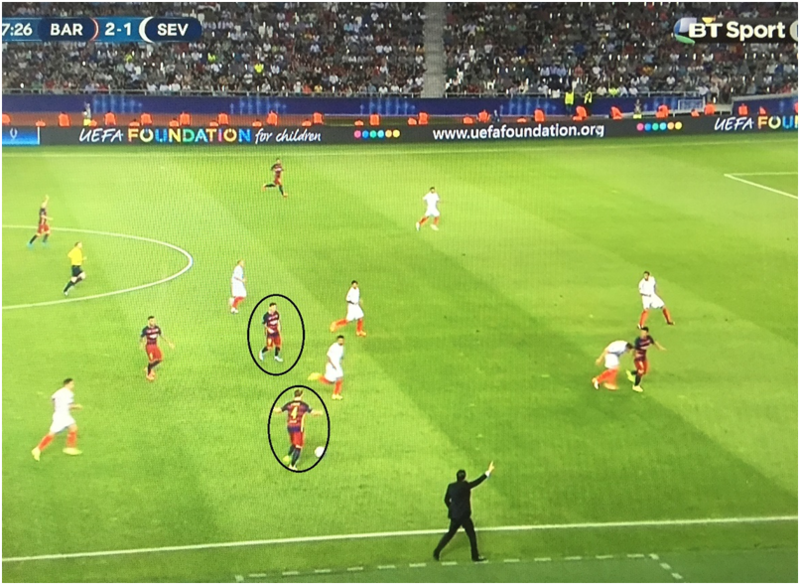 However, the clear understanding of positioning from Mathieu and Mascherano is poor in this situation. Mathieu is marking the furthest Sevilla player forward while Mascherano is trying to keep a good line with Pique. 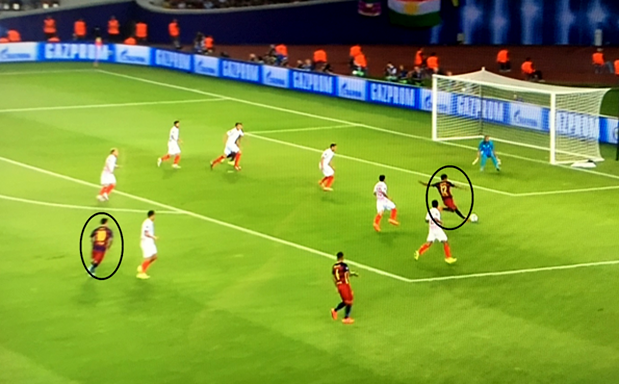 The danger here is obvious, it’s the two Sevilla players in between Barcelona’s defensive and midfield lines. Three seconds later, Sevilla score. Mathieu and Mascherano have failed to deal with the runners movements into the box. Experienced defenders shouldn’t be making sloppy mistakes like this. Both Mathieu and Mascherano become attracted to the player running front post and don’t realise Reyes targeting the back post area. How could this goal have been prevented? Mathieu passes his marker onto Mascherano and he can moved four feet back and mark the back post area. If they had done this, Sevilla’s chances of putting the ball into the back of the net would have been slimmer. Once again, Barcelona failed to deal with Sevilla’s runners in the box which led to their third and fourth goals. Pictured below is the defenders positioning before the fourth goal which took the game into extra time. Mascherano and Pique have been dragged across the box into an area where they’re not very effective. Firstly, Mascherano doesn’t have to be over that far, the blue circle marks out where he should have been. Mascherano’s poor positional awareness has then caused Pique to move over as well. If he didn’t, there would have been a larger area of space in front of ter Stegen a runner could have took advantage off. The blue circle next to Pique is where he should have been positioned. However, this all comes down to Mascherano’s over – eagerness to win the ball back – just like the second goal Barcelona conceded. Sevilla’s attacking principle is related to Barcelona’s defensive vulnerability. But it takes clear understanding and timing to actually exploit your opponent’s weaknesses, and Sevilla had done superbly in doing so. Their last three goals came from this method of attack. The first, Reyes scores at the back post, for the second, Sevilla win a penalty from a run in the back post area and they score at the back post for their third goal in the second half. Let’s look a little closer at this attacking principle and how it worked to perfection. Sevilla’s speed in this counter attack situation allows them to score this goal, any slower and it will be more difficult for them to have a goal scoring opportunity. They have three runners aiming to get into the box at the correct moment. Their chances of doing this are high due to the previously spoken vulnerability of Barcelona’s defenders in this moment of the game. The furthest player forward has attracted Mathieu inside, creating space on the other side of him for Reyes to timely run into. In Barcelona’s view this is obviously a poor goal to lose, but for Sevilla it has been timed to perfection. Sevilla have set up accordingly in the box, one player at the front post area, one deep and centrally and one at the back post area. In order for this goal to be scored, Reyes has to meet the ball at the correct time. If he’s too early the ball may go past him, if he’s too late Sevilla will miss the opportunity to score. For their fourth goal of the game, Sevilla’s runners into the box are once again in the key areas. The player at the front post area received the ball to cross, there’s one deeper and one making a run towards the back post area. Sevilla have effectively exploited Barcelona’s weakness for the third time in a row – resulting in three goals. 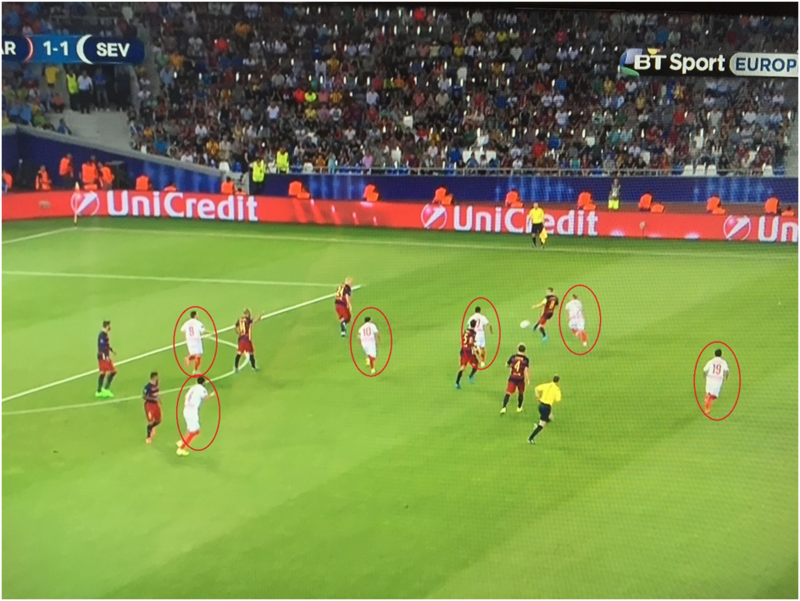 One player who holds a key position in this method of attack is the deepest Sevilla player in the box. If Barcelona’s positioning was better, the cross in front of the goal may not have been available, meaning the next best option would be to cut the ball back to the deepest player who would have time and space to place his shot. When teams come up against a team of Barcelona’s quality it’s dangerous to constantly press. If a team does, Barcelona have the quality to exploit the free space effectively. 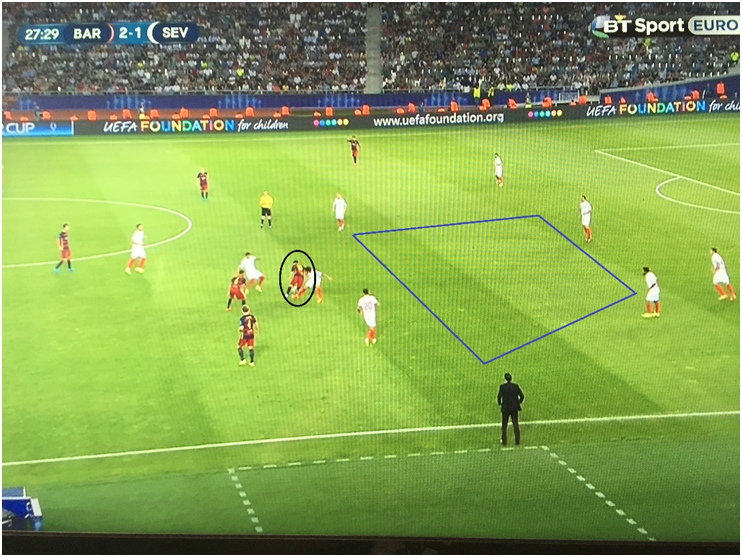 In certain moments of the Euro Super Cup Final, when Sevilla lost the ball in specific areas they pressed with high numbers in order to win it back. When Barcelona were keeping possession deep, Sevilla held an okay organised defensive structure in their own half, trying to limit the space Barcelona can exploit. As you can see from the picture above, Sevilla have committed four players to press the ball and another two on the other side of the pitch. This situation occurred after they lost the ball when attacking. Although many teams aim to win the ball back high up the pitch once they’ve lost possession, it’s dangerous doing this against possibly the best technical side in the world. Barcelona were effective in this case, getting the ball out only for Rafinha to take a poor touch causing the ball to go out of play – ironically. The situation presented in the above image is another example of Sevilla’s ineffective pressing. They have five players pressing for the ball, and it still gets through a small gap to Iniesta. In order for this not to occur, one of the two players pressing Busquets from the front has to be deeper than the other. By doing this, they are a better angle to intercept the ball. This poor press led to Iniesta taking possession of the ball and creating a goal scoring opportunity. In terms of the game attracting plaudits in terms of individual talent and brilliance, it did. However, both managers may be disappointed in their defensive vulnerabilities but satisfied with their attacking methods. 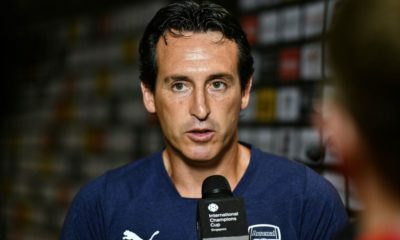 Particularly Unai Emery, as his side scored three goals from their attacking principle aiming to exploit Barcelona’s defensive vulnerability. Barcelona have now won their first trophy of the season, with a possible second coming soon as the Spanish equivalent of the Community Shield is upon the horizon. Credit to Sevilla though, who caused the game to go into extra time, only for a Pedro goal to win the game for the current European Champions.